Earlier this month I spent an enlightening week in Colorado at a peer review meeting hosted by the US Department of Energy. Well-attended by about 300 people from organizations like Lawerence Livermore Labs, Berkeley, Stanford, Sandia National Labs, and *ahem* Agile, delegates heard about a wide range of cost-shared projects in the Geothermal Technologies Program. Approximately 170 projects were presented, representing a total US Department of Energy investment of $340 million. I was at the meeting because we've been working on some geothermal projects in California's Imperial Valley since last October. It's fascinating, energizing work. Challenging too, as 3D seismic is not a routine technology for geothermal, but it is emerging. 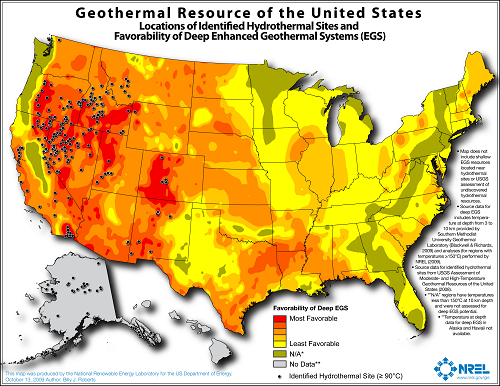 What is clear is that geothermal exploration requires a range of technologies and knowledge. It pulls from all of the tools you could dream up; active seismic, passive seismic, magnetotellurics, resistivity, LiDAR, hyperspectral imaging, not to mention the borehole and drilling technologies. The industry has an incredible learning curve ahead of them if Enhanced Geothermal Systems (EGS) are going to be viable and scalable. John McLennan & Joseph Moore at the the University of Utah have done some amazing laboratory experiments on large blocks of granite. They constructed a "proppant sandwich", pumped fluid through it, and applied polyaxial stress to study geochemical and stress effects on fracture development and permeability pathways. Hydrothermal fluids alter the proppant and gave rise to wormhole-like collapse structures, similar to those in the CHOPS process. They incorporated diagnostic imaging (CT-scans, acoustic emission tomography, x-rays), with sophisticated numerical simulations. A sign that geothermal practitioners are working to keep science up to date with engineering. Stephen Richards bumped into me in the corridor after lunch after he overheard me talking about the geospatial work that I did with the Nova Scotia Petroleum database. It wasn't five minutes that passed before he rolled up his sleeves, took over my laptop, and was hacking away. He connected the WMS extension that he built as part of the State Geothermal Data to QGIS on my machine, and showed me some of the common file formats and data interchange content models for curating geothermal data on a continental scale. The hard part isn't nessecarily the implementation, the hard part is curating the data. And it was a thrill to see it thrown together, in minutes, on my machine. A sign that there is a huge amount of work to be done around opening data. Dan Getman - Geospatial Section lead at NREL gave a live demo of the fresh prospector interface he built that is accesible through OpenEI. I mentioned OpenEI briefly in the poster presentation that I gave in Golden last year, and I can't believe how much it has improved since then. Dan once again confirmed this notion that the implementation wasn't rocket science, (surely any geophysicist could figure it out), and in doing so renewed my motivation for extending the local petroleum database in my backyard. A sign that geospatial methods are at the core of exploration and discovery. There was an undercurrent of openness surrounding this event. By and large, the US DOE is paying for half of the research, so full disclosure is practically one of the terms of service. Not surprisingly, it feels more like science going on here, where innovation is being subsidized and intentionally accelerated because there is a demand. Makes me think that activity is a nessecary but not sufficient metric for innovation.